There’s quite a luxury in having a garage. The best aren’t only a place to secure your car, but function as a storage space for bikes, gardening equipment and other bulky items too. Some garages might even have a small toilet and an area to work. When you’re drawing up your budget for external builds and projects, it’s extremely easy to underestimate the costs of building a garage. It’s just a single-story box, right? Wrong. You should treat garages in the same way you’d consider an extension, and so you’ll need a budget to match. So, what is the cost of building a garage? For an extremely basic detached and double garage, you should be prepared to pay at least £18,000. Though this might sound expensive, it actually only covers the mere essentials. A budget of this scale allows you to build a 36m² garage that’s brick built, matches the style of your home and measures 6m wide, 6m deep and 2.5m high. Assuming you’re installing two single garage doors, a little rainwater drainage, a simple electrical supply, a window and a personal access door, the breakdown of figures should be as follows. 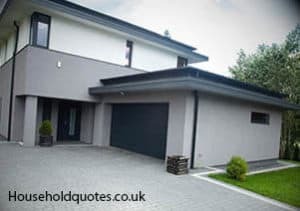 Get FREE Garage Quotes Today! With this budget, you’d be able to construct a watertight, functioning and very simple garage. However, many of the standard requirements aren’t included. For example, the walls included in the above quote are only half a brick thick. If you wanted to construct cavity walls and include insulation, you’ll need double the brickwork at a minimum. Meanwhile, the roof pitch quoted for is at a 25° angle; if you need this higher for aesthetic reasons, you can expect to pay more. In addition, once you add extra plumbing for a tap, a better roof covering and seal the concrete slab, your budget can rise to at least £25,000. When you’re working out the cost of a garage, it’s important to remember there are other expenses involved in addition to materials and building costs. For example, the average prices already mentioned don’t include the cost of a project foreman. If you’ve got no intention of managing the build yourself, you’ll have to pay someone to do it. You may also need to gain planning permission for the project, and this could come hand in hand with its own costs, particularly if approval isn’t given straight away. In addition, if you’re adding a garage to a property that’s already in place, you won’t qualify for a zero VAT rated status. As a result, you’ll need to add VAT on top of your project. Get FREE Garage Quotes Today!If you’re looking to keep costs down, then you might consider building the garage yourself. There should be no illusions; this is a big project. However, because it’s not part of your main home, there’s the luxury that you can just shut the door and continue the build at your own pace. On the downside, unless you’re an expert builder, it’s likely to take you some time to complete. But if speed isn’t a problem, doing the work yourself could be ideal. You’ll still need the completed work to be inspected and signed off by a professional, and some work, such as the electrical components, will need to be completed by a professional. However, by using Quotatis to find local contractors, you can negotiate costs for these individual jobs and still save a lot of money this way. Building a garage isn’t cheap, and it’s essential to look at it as a major extension project rather than some simple external work. However, done right and with a careful hold on the budget, you can create a beautiful garage for under £20,000. I am about to move int oa house that has a garage built in, however, it has been converted into a utility room, but, the wall is a false wall and the garage can very easily be restored back as the door is still functioning, it has just been locked and with the wall, its blocked its use. Now, the driveway comes up through the middle of the front garden, the left side ( looking from the house down the driveway ) is slabbed and garden is heathers and hedges and the right side is fairly open and can park perhaps 4 or 5 cars ( very tightly ) and there is plenty of room for an external concrete garage, however its on a slope and the bottom section is gravel and the middle section is bricked and the top section is tarmac ( yes, its bloody awful ). And so I am considering the job, because my next door neighbour has done it on his home, however his cost him £3500 to do fully do it, and that does include the foundation, the steel supports and the concrete walls. His is a single however, and he did the whole thing himself and thegarage itself is pre-fab. Im looking to be paying absolutely no more than £5K and what this suggests is that I am quite probably not going to get any luck in doing it and that the Utility room might have to go back to a garage!